Huawei P30 Series was officially met with Chinese consumers at the Huawei 2019 Spring new product launch held in Shanghai on 11th. As the flagship new product, the first-class hardware configuration led by the self-research chip Kirin 980 naturally does not have to say much, of which Huawei P30 Pro's rear Leica Kashi camera is impressive, it can still maintain a stable play in the limit of weak light environment, but also through the potential zoom lens to achieve up to 50 times digital zoom shooting Vision, once released, the DxOMark camera list was refreshed with 112 points. In addition to these, I believe that users are most concerned about its screen quality, so today let us use professional equipment to explore the bottom of it. Huawei P30 Pro uses a 19.5:9 proportional curved screen. The pirate design that abandoned the previous generation P20 turned to a higher screen size solution with a screen ratio of 6.47 inches. The resolution is the same as the Huawei P30 of the smaller one. 2340×1080 without increasing the resolution to 2k like the Mate20 Pro. The OLED screen of the P30 Pro comes from BOE and not the Samsung we are familiar with. Generally speaking, the edge of the display font is not clear, and the screen does not look transparent. It can be basically caused by the arrangement and resolution of the pixels, then it What is the arrangement of it, let us look down. 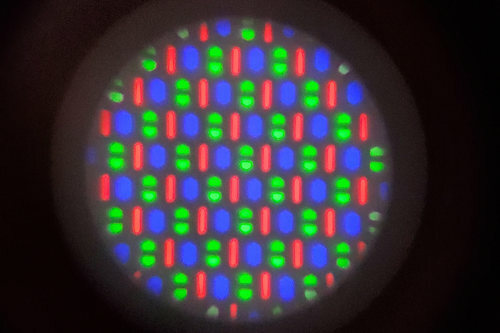 Our common RGB arrangement, will be a square pixel divided into three, each display a color, RGB (red, green, blue) three-boson pixel size is the same, display is more delicate, but red and blue pixels’ life is relatively short, density breakthrough 300ppi will affect screen life. 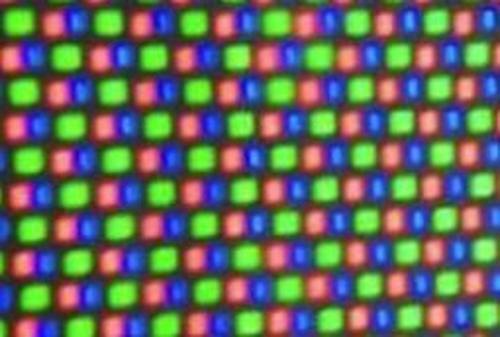 At present, Samsung A screen practical arrangement, by reducing the number of red and blue pixels by half to achieve higher PPI. Green pixels are complete, so the horizontal and vertical text can be displayed perfectly, but easy to appear color edge situation, Samsung's approach is to further enhance the resolution to solve this phenomenon. This arrangement is the same as the number of traditional RGB sub-pixels, but only two sub-pixels per pixel. 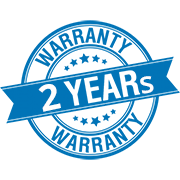 Display resolution is 2/3 of traditional RGB, equivalent PPI ratio 72%, easy to blur when displaying vertical text. 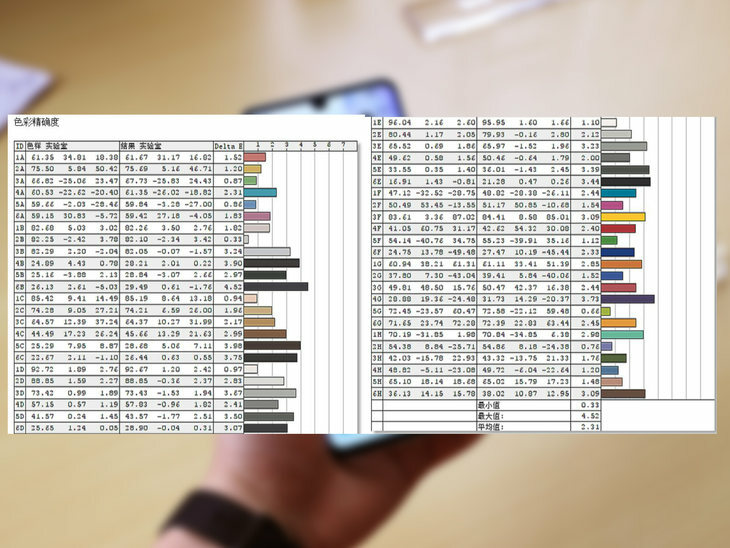 Below we can see the pixel arrangement of Huawei P30 Pro screen, similar to the normal RGB tri-color pixel arrangement and slightly different, more like the Delta arrangement of the revision. The following figure shows that the green sub-pixel changes from one to two, the same as Samsung's diamond arrangement, is 1/3 less RGB, the equivalent PPI ratio is the same as Samsung 81.6%. Calculating the screen PPI is higher than the theoretical retinal resolution of 250ppi, consistent with the iPhone XR 326ppi, and Samsung with a wide screen ratio is not low. However, from the arrangement can be found, in the text display vertical stroke can be perfectly presented, in the horizontal line may appear blurred situation. The display effect is not good or it may be a complete result of sub-pixel rendering and active color management without optimization. The highest brightness of the screen will directly affect the display effect in use, after testing Huawei P30 Pro screen default maximum brightness reached 499nit, the average maximum brightness of 480nit this result is better than the previous test of a number of models. Using a flashlight to irradiate the light sensor to excite the highest brightness under strong light, with an average maximum brightness of 657, is also a very good result. Use outdoors without worrying about the display of the screen due to strong light exposure. 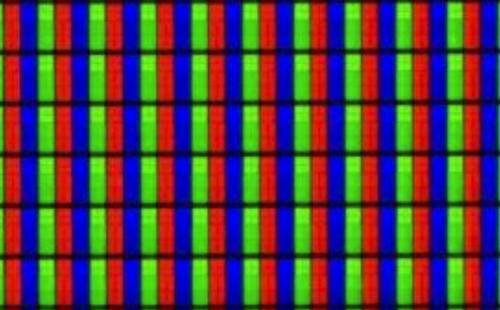 A gamut is a color coverage that a screen can display, and usually a wider color gamut can lead to richer color displays. 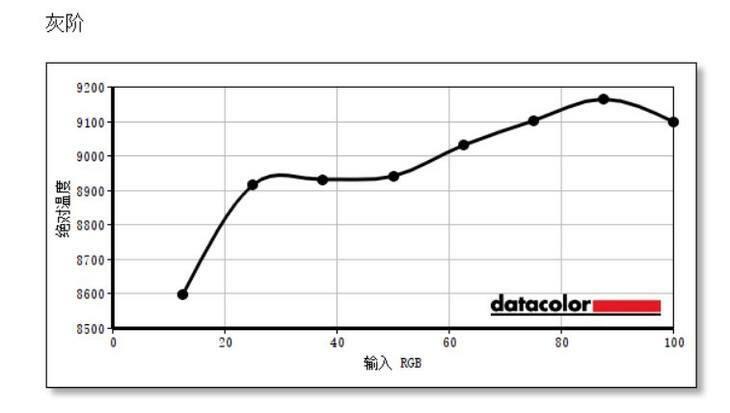 It is usually said that sRGB, AdobeRGB, NTSC three color gamut, can basically be considered 100%sRGB=72%NTSC, 100%AdobeRGB=95%NTSC. We selected the color display of P30 Pro as the default "bright" mode, and the color gamut capture results through the red spider 5 School color meter are as follows. The green range in the figure is the sRGB gamut range, the yellow is the NTSC gamut range, the purple is the AdobeRGB gamut range, and the red part is the range that the test model can reach. P30 Pro This screen from Jingdong is capable of 100% full coverage of sRGB and can cover the 84%AdobeRGB gamut, about 71.4%NTSC gamut. The default color mode color gamut coverage for several comparison models is as follows: Huawei Mate20 Pro has a 94%AdobeRGB gamut, with the widest range of color domains covered by 89.3%NTSC gamut, Samsung S10, reaching the 97% AdobeRGB gamut, and the 92.15%NTSC gamut, The gamut range of Xiaomi 9 also supports 94% AdobyRGB. It can also be found from the figure that Huawei P30 Pro has a smaller area covered by the green display. 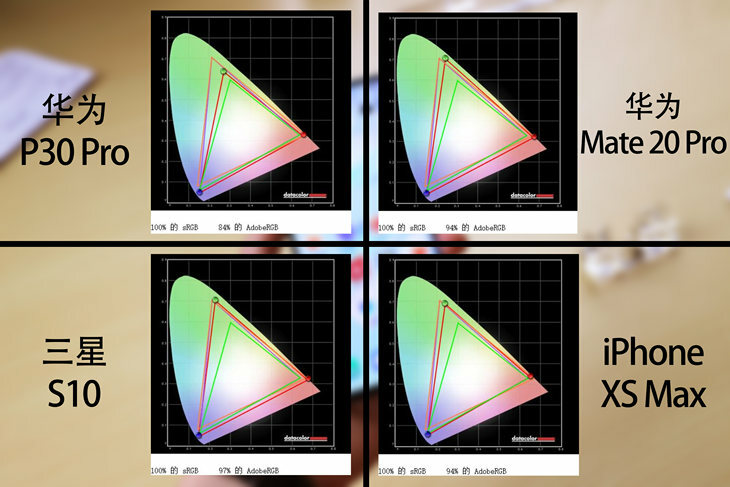 Screen color temperature in the brightness of each gear close to 6500k is best, higher than 6500k is colder, lower than the warmer, while the more stable the curve the better. 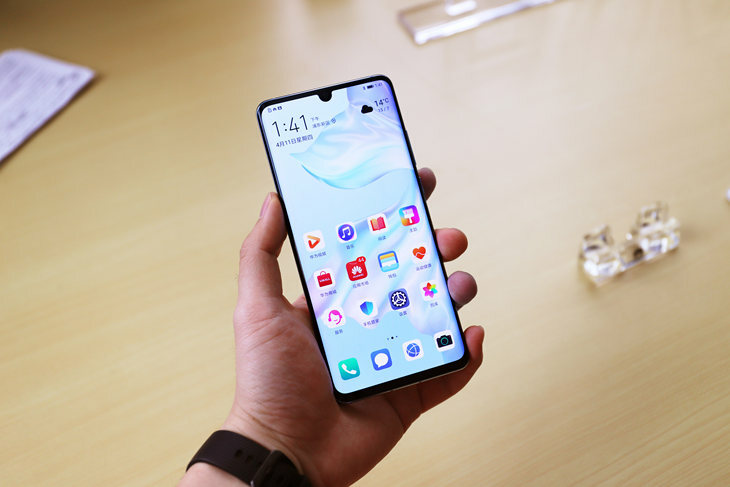 The screen of four mobile phones can be found to be cold in the color temperature of several models, but Huawei P30 Pro's curve is the most stable change in several screens. Of course, the color temperature is cold and warm does not use too much worry, because in the system have manual adjustment function. 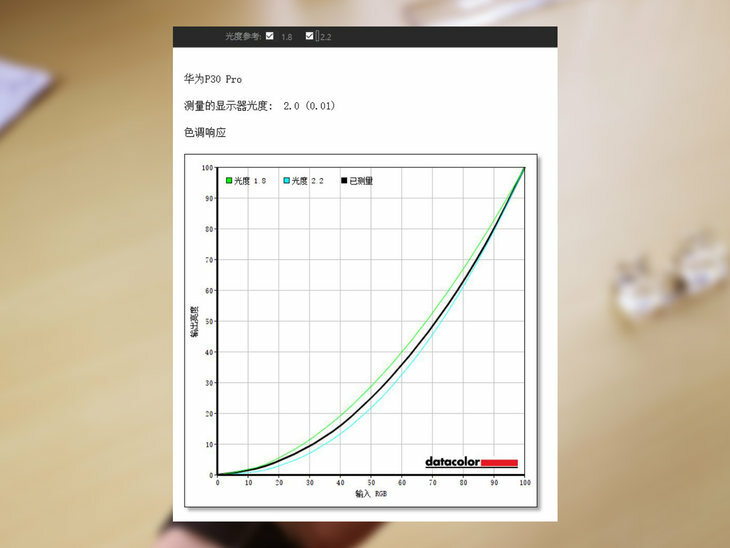 Refers to the screen according to the display color changes, how long can react, combined with the following figure black curve is measured results, the closer the black curve to the blue curve indicates the faster the response speed. 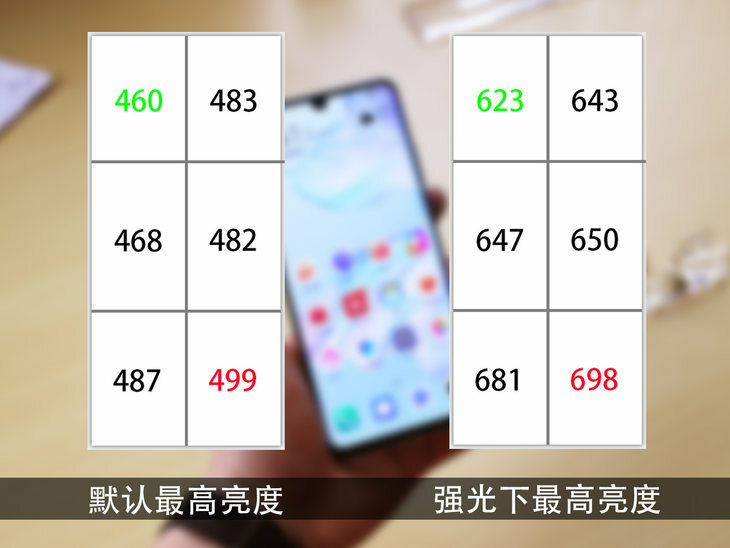 Huawei P30 Pro's screen scores are within the ideal range. This is what we often call the color test. The software lets the screen display 48 specific colors, the displayed color is received by the instrument and compared with the default information, and finally the measurement accuracy of the screen is obtained. The shorter the bar in the chart, the more accurate the color display is. The minimum value is 0.33, the maximum value is 4.52, and the average is 2.31, which is not excellent but at normal level. After a series of tests, we can find that the Beijing Oriental surface OLED screen used by Huawei P30 Pro is not as bad as it is on the Internet. 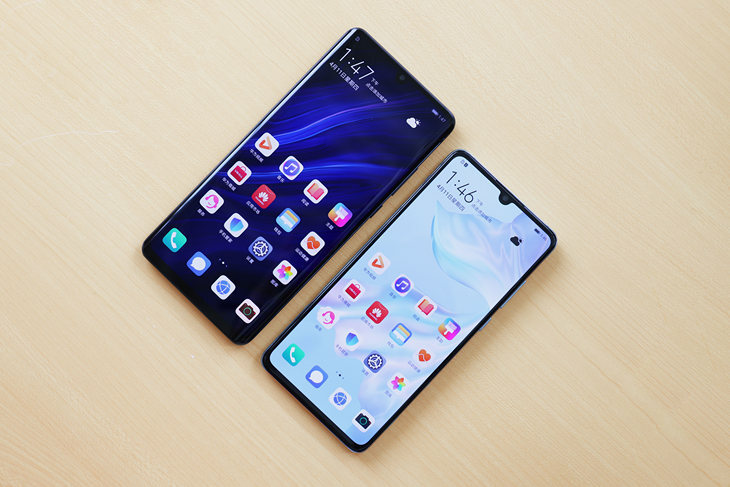 Summarize the advantages of the screen, which uses a special pixel arrangement, but PPI is no different from Samsung's same size screen, and the screen PPI is almost as delicate as the iPhone XR. 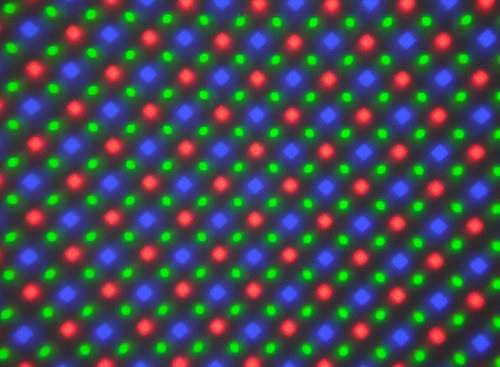 Screen color gamut in the green display is not rich enough, color gamut coverage compared to the same level of the flagship has a certain gap, color is not excellent but at the general level. In terms of screen brightness has a great advantage, the default maximum brightness and strong light excitation brightness are at a very high level. 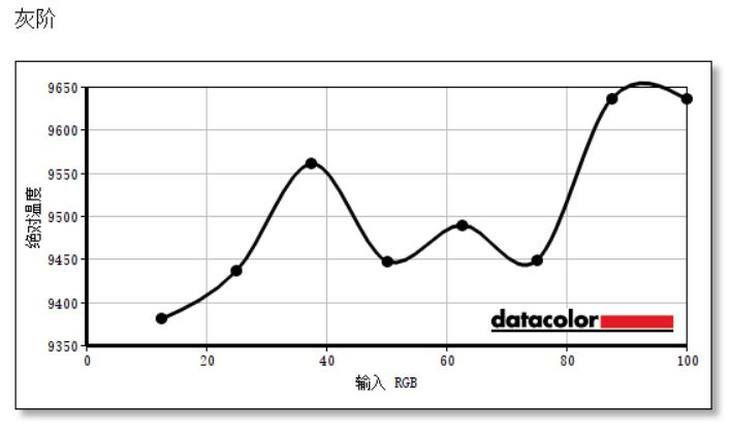 Its tone response speed is good, gray scale, color temperature curve is the most stable. The above is the whole content of Huawei P30 Pro screen quality, hope to be able to use the data way to let you really understand this product, and to your purchase is helpful.